When the current concept of service learning was just emerging in the mid-1980s, I was the editor of the only national newsletter to promote this idea in schools across the United States. While contemplating ideas for articles I had a sudden thought: Books with Heart, books that would inspire and engage readers to care and then to act in ways that benefit others. Little did I know that my first list of a dozen or so books would illuminate my thinking about service learning to add a most essential component: Literature. I find television very educational. The minute someone turns it on, I go to the library and read a book. The Complete Guide has 13 thematic chapters, each with its own “bookshelf,” so users can easily find the exact book to advance their lessons and to engage young readers. Whether read aloud or silently, the books included in each bookshelf are guaranteed to make you and your students smile, laugh, cry, think, wonder, dream, plan, hope, and act. Well-written books such as those listed in the bookshelves provide many benefits. They tap into students’ curiosity and desire to know. They can give students the information they need to move to the next level of competency or inspire them to consider important topics. Authors model how to write, how to think creatively, and how to tell one’s own story. When the story conveys a concern shared by the students, a range of possibilities for their own actions can emerge. Reading is clearly the foundation of learning. However, books can only go so far. In our classrooms, we want books that inspire students to action, books that provide knowledge and engagement and that stimulate intrinsic motivation for service. These bookshelves hold a myriad of titles that belong in the hands of students and that are resources for teachers, program staff, or family members who want to introduce a topic, expand knowledge, or develop an inquiring mind. Service learning is taught in many teacher-preparation programs as a must-include pedagogy. Personally, by traveling over 120 days per year to speak on service learning and related education topics, I see the interest at all grade and ability levels. Through its impact on students and teachers, service learning has proven it deserves its rightful place in our classrooms. And from those initial days with a newsletter to promote books as part of the service learning process, now this concept of integrating age appropriate and select literature is alive and well in schools across America and around the globe. The process of service learning can best be understood through the Five Stages, and for each stage we can see the important role literature can play. All service learning begins with Investigation: 1) investigation of resources within the student population, called a “Personal Inventory,” and 2) investigation of the community need. A personal investigation is of great value, with students interviewing each other to identify and consolidate an inventory of each person’s interests, skills, and talents. This list, often kept in a visible location in the classroom, is then referenced, employed, and developed while going through all service learning stages. (Note: this idea of interviewing reappears throughout the service learning process; consider how many skills are developed and reinforced through this experience.) Next, young people identify community needs of interest and begin their research to authenticate this need. Often called “social analysis,” students design a survey, conduct interviews, use varied media such as books and the Internet, and/or draw from personal experiences and observations. Students then document the extent and nature of the problem and establish a baseline for monitoring progress. This method can be adapted to all grade levels. Consider how books can be helpful in this stage to introduce topics, provide examples of how different research has been conducted, and complete research. If students want to investigate issues related to health, cancer in particular, the novel Bluish by Virginia Hamilton can assist upper elementary students in developing questions and empathy. Drums, Girls, and Dangerous Pie by Jordan Sonnenblick, a novel that weaves humor into the serious topic of a teen’s experience when his younger brother is diagnosed with cancer provides an example of what kids have done to be helpful to families in difficult situations, a perfect book for middle school through ninth-grade students. Preparation and planning covers a wide variety of activities, as teacher and students together set the stage for learning and social action. Academic standards are alive and well as teachers make certain their curricular intentions are met. The difference from other teaching approaches is students are typically more engaged by having a purpose, a need they authenticated during investigation. Integrating students’ interests, skills, and talents keep them motivated as they learn more about the topic interwoven with class content. As this occurs, teachers and students note what skills need to be acquired or improved to have greater efficacy. Students explore, research, and discuss topics by using books and the Internet, by interviewing experts, and by going into the community or bringing the community into the classroom. Through active learning and critical thinking, students understand the underlying problem and related subject matter. Analysis, creativity, and practicality lead to plans for action. Books are a natural and necessary part of preparation and planning, as are newspapers, journals, and other media that excite the learner. Students delve into topics for greater awareness. They gain perspective and a point of view, particularly regarding situations we hope students will never be in, for example, experiencing a tsunami or extreme poverty. Their understanding of time and place becomes more attuned as they experience the convergence of past and current history. Literature also shows different approaches to or writing styles on a similar theme and can include examples of what young people have accomplished through service. As students decide to address bullying on campus and learn about this topic, elementary grades will relish The Bully Blockers Club by Teresa Bateman. Older students use this book to put on skits for the younger ones, and both benefit. James Howe’s Pinky and Rex and the Bully is excellent for elementary classrooms and The Misfits, for middle schools, is a book that has given birth to National No Name-Calling Week. Now with two sequels, Totally Joe and Addie on the Inside, Howe’s books can inspire both the love of reading and the imperative for action. Deborah Ellis’ young adult novel Bifocal is exceptional for looking at how rumors and prejudice impact high school students in the wake of September 11. Most notable in the nonfiction category is Ellis’s recent addition to her long list of excellent titles, We Want You to Know: Kids Talk About Bullying. A book for all ages, this compels students, teachers and administrators to move beyond awareness into a plan for change. Action is the direct result of preparation. Students carry out their plan, apply what they have learned, and benefit the community. Perhaps they plant flowers to beautify school grounds, write original stories to read to younger children and donate to their classrooms, or reduce the usage of electricity at school to save money and mitigate carbon output—the possibilities are limitless. Always, this action has value, purpose, and meaning as students continue to acquire academic skills and knowledge. In fact, the action stage often exposes a piece of information or skill that is lacking, and students eagerly work to learn what is needed to be more effective in their community action and gain a clearer perspective on the concept of community. Over the course of the experience, students raise questions that can lead to a deeper understanding of the societal context of their efforts. Their action can be direct service, indirect service, advocacy, or research—but always it meets that recognized and authenticated need. By taking action, young people identify themselves as community members and stakeholders and apply what is inherently theirs—ideas, energy, talents, skills, knowledge, enthusiasm, and concern for others and their natural surroundings—as they contribute to the common good. Even during the action stage, books can be essential. They can be read at the beginning of an experience to give a community reference point to all participants. They can be used in tutoring programs to teach ideas and concepts, and to dramatize for an educational purpose. For example, 14 Cows for America by Carmen Agra Deedy would be perfect to read at the beginning of a September 11 commemoration. Gone Fishing: Ocean Life by the Numbers by David McLimans could be used to teach numbers to students and could lead to a joint activity to care for the environment. The Wartville Wizard by Don Madden is hilarious to act out as a service learning activity around Earth Day or any day to raise awareness of litter and trash. Reflection, a vital and ongoing process throughout all the stages, integrates learning and experience with personal growth and awareness. Using reflection, students consider how the experience, knowledge, and skills they are acquiring relate to their own lives and communities. The academic program is often so jam-packed that it’s easy to miss the meaning behind the details or within the experience. Reflection is a pause button that gives students time to explore the impact of what they are learning and its effect on their thoughts and future actions. By reflecting, students put cognitive, social, and emotional aspects of experience into the larger context of self, the community, and the world. This helps them assess their skills, develop empathy for others, and understand the impact of their actions on others and on themselves. They can also consider what they would change or improve about a particular activity. The modality needs to vary to achieve depth and can emphasize different multiple intelligences through writing, speaking, art, poetry, and movement, to name a few. 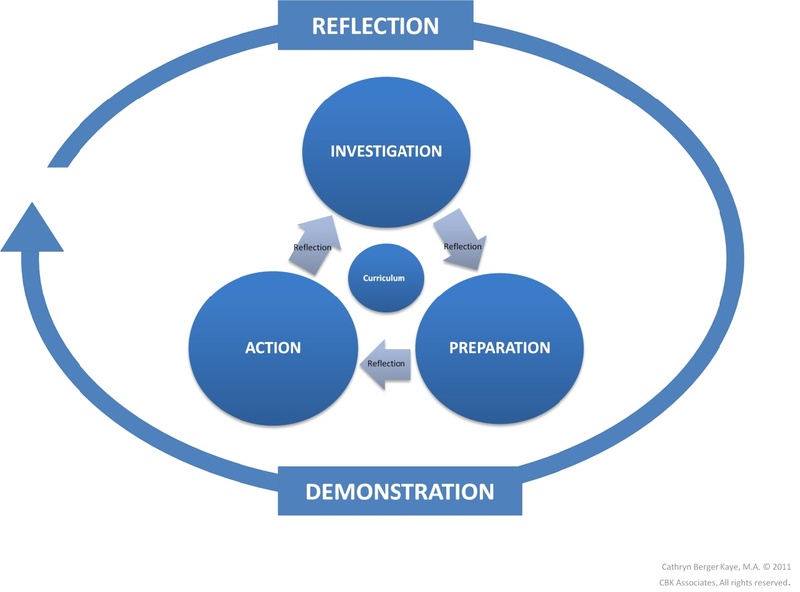 After seeing how you lead reflection, you’ll find that students can devise their own strategies for reflection and can lead each other through the reflective process. Demonstration, or what I often call “The Big Wow!” allows students to make explicit what and how they have learned and what they have accomplished through their community involvement. They exhibit their expertise through public presentations—displays, performances, letters to the editor, photo displays, podcasts, class lessons—that draw on the investigation, preparation, action, and reflection stages of their experience. Presenting what they have learned allows students to teach others while also identifying and acknowledging to themselves what they have learned and how they learned it—a critical aspect of metacognitive development. Students take charge of their own learning as they synthesize and integrate the process through demonstration. Always the emphasis should remain on the intrinsic benefits of learning and the satisfaction of helping to meet community needs. Through demonstration, we also recognize student accomplishment in a public way and show students that school and community members understand, appreciate, and value their contributions. Keep in mind that demonstration begins at the beginning, as students document their entire service learning process so they have a comprehensive story to tell about their learning and their service. Whatever books students have used along the way are part of the demonstration. This can also expand in the community as several schools I have worked with have “demonstrated” their success by promoting “community reads” programs—selecting a book or books that the entire community reads and has opportunities to meet and discuss. Authors and Ten Must-Have Books! Back in my early days of connecting service learning and literature, I had a nagging question: What inspires authors to write these books? I wanted to find out. Over the years I have interviewed 40 authors about why they wrote their books and how they approach the writing process. They also shared stories from their readers about social action that occurred because of their book. Eileen Spinelli, author of many delightful picture books including Somebody Loves You, Mr. Hatch, told me, “A businessman in New York read Mr. Hatch and began to send flowers anonymously to his employees. . . . One teacher told me that on Valentine’s Day she placed a bag of candy at the door of a neighbor who had been giving her a hard time. She told the kids, and they made Valentines for classmates they were having a hard time with. I have heard of kids taking brownies and lemonade to the fire department; others have visited nursing homes.” Now you can read this charming book to see how all this connects learning to service! Author Francisco Jiménez, who has written several memoirs about his experiences growing up as a migrant farm worker in central California such as The Circuit, Breaking Through, Reaching Out, and the picture book, La Mariposa, told me, “When growing up, there was hardly any material in school I could relate to regarding my cultural background. In my writing, I hope to contribute to a body of American literature that many children can relate to, especially those from similar backgrounds as mine.” Eve Bunting, James Howe, Jerry Spinelli, Janet Tashjian, Jordan Sonnenblick, Pat Brisson, among others, shared their reasons for writing, and more. Tony Johnston, author of the fabulous Any Small Goodness and Bone by Bone by Bone, described writing ideas for her books on Post-its while on morning walks. She checked into a motel for a week, spread the notes on the floor, and wrote two novels using this method! Deborah Ellis revealed how she travels and lives in different parts of the world to research her stories, both fiction and nonfiction. This method has led to her outstanding collection of books, including No Safe Place, Off to War, I Am a Taxi, and Jakeman. Where can you find these interviews? Twenty-eight of them are on the CD-ROM included with my book The Complete Guide to Service Learning. Over the years, this literature and service learning partnership has led me to invite quite a few authors to co-present with me at conferences. Since these authors are my “rock stars,” I am most grateful they have joined me on my mission of finding books with heart. In Our Village: Kambi ya Simba through the Eyes of Its Youth by Students of Awet Secondary School, edited by Barbara Cervone, is a service learning book that brings a small remote village in Tanzania into your classroom. This book was the impetus for me to initiate In Our Global Village with Barbara Cervone, which invites students around the world to write books back to the Awet students. Find out more at www.inourvillage.org. Nonfiction, all ages. Now, I said I would give you my top ten, but I did sneak in other favorite books throughout the article! As you venture into service learning, know that you are joining many colleagues who have been inspired by the essence of what we all entered into teaching for in the first place: To make a difference in the lives of children. Enjoy the books, and enjoy the journey! Cathryn Berger Kaye, M.A., has written many books and articles on service learning, and developed a curriculum Strategies for Success with Literacy: A Learning Curriculum that Serves to advance high level literacy skills and social emotional development with service learning applications. Visit her website at www.abcdbooks.org or email her at cbkaye@aol.com. Check her calendar for when she is speaking near you! Portions of this article are adapted or excerpted from The Complete Guide to Service Learning, revised and updated second edition, by Cathryn Berger Kaye, M.A. (Free Spirit Publishing, 2010, http://www.freespirit.com), with permission from Free Spirit Publishing. Cathryn Berger Kaye, CBK Associates 2012 © All rights reserved.